Aren't they beautiful? 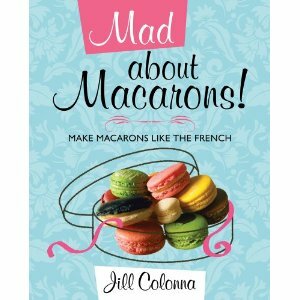 And the secret to macarons was waiting for me all along in this book, which I saw out of the corner of my eye in Bookham library. I have a lot to thank this lady for, because she taught me that macarons are actually pretty easy. Yeah, I said it. All that banging the trays on the work surface like you see on GBBO? Not necessary. Folding the mixture oh-so-carefully to preserve every tiniest air bubble? No. Aging the egg whites? Please. All you need to do is follow a few simple steps, be precise with your ingredients and you can make macarons like the French. And then, and this is the exciting bit, you can start experimenting. I already have, and the process below is the result of one of my experiments. But as I haven't perfected that recipe yet, I'll give you the ingredients to a different macaron - lemon and cardamom. This recipe makes 12-16 depending on size. 1. Sift the icing sugar and almonds together into a bowl, using a medium sieve. Any pieces of almond that won't go through, chuck them out and replace them with some that will. 2. Beat the egg whites in a very clean bowl, adding the caster sugar gradually until they reach stiff peaks. You'll want to add the colouring at some point during this process. 3. Mix the egg whites into the dry ingredients using a spatula or large metal spoon. You don't need to be too careful about folding the mixture to keep the air in. I know this will sound strange if you're an experienced meringue maker but bear with. 4. You now need to use a spatula to press down on the mixture, squashing it against the bottom of the bowl to squash the air out until the mixture is smooth and ribbons off the spatula. This will definitely take no longer than 5 minutes. 5. Put the mixture in a piping bag and use a clean spatula to push the mixture down towards the tip of the piping bag. Then twist the piping bag above the mixture to stop the mixture from coming out the top and snip the tip off, leaving a 1cm wide hole. 6. Pipe rounds of about 3cm onto the lined baking tray and then leave at least 30 minutes to set until they are dry to the touch. If you like you can decorate them with seeds, finely crushed nuts or cocoa powder before they set. While they set preheat the oven to 160C for a fan oven, 170-180C for a non-fan oven. 7. Bake in the centre of the oven for 10-12 minutes but set a timer for 8 minutes and check then - they may not need any more baking. When cooked leave to cool on the baking tray then scrape off carefully with a palette knife or flat spatula. 8. Match up the discs to ones of equal size and either pipe or spoon the filling onto half of the discs, then place its partner on top, using a circular motion so that the filling squashes enticingly just out of the shell. As you can see, those experimental ones (they happen to be mojito flavoured in case you're interested) didn't turn out quite as pretty as the others. They are very pretty. As you can see, you can also decorate them with drizzles of chocolate, dipping in melted chocolate or using my old favourite, edible glitter.